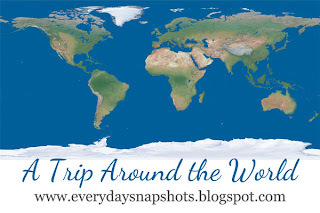 For the 2012-2013 school year we are doing a study of world geography by touring various countries around the world. The idea is to give them an introduction to different cultures and make them familiar with the world map before we begin our world history studies. Oh, and to make learning fun too! Feel free to join us on our trip, as I list the resources we use and the countries we study. Expedition Earth – I bought this with the hope that I could just open it up and follow it, but sadly it just wasn’t our style. If you like crafts and tests, then this is a wonderful resource for you. I still feel I got my money’s worth out of it, because we are using some of the reading assignments, the printable passports, flag stickers, and country fun fact pages. I also used the table of contents as an outline, as I decided what to do when. This resource is very well done, and I can tell the author put tons of time into it, we just typically use a more literature-based, art over craft approach. WeeBeeTunes Travel Adventures – Get Your Passport! and WeeBeeTunes Travel Adventures – The Journey Continues – These are not really scheduled in, but the kids have been watching them. Sometimes I make watching the DVD an “assignment” if I need to get something else done in the middle of the school day. Good books — The books for each country are listed in each individual country’s post below. My method for choosing books largely depended on using what our library had on its shelves. I encourage you to do the same.